the use of crisis is one of the enemy’s most common ways in trying to discourage and cripple the faith and hope of followers of Christ as seen through out the church Age up until this present season. Yet, it also one of the most precise apostolic tools the father employs in the building and perfecting of the faith virtue of the saints. When we look at the New Testament church, we observe how crisis shaped and build the apostolic culture of the saints. They were glad to go through the challenges and persecutions the enemy threw at them. The more they were threaten not to speak the name of Christ publicly, the more they proclaimed his name, power and glory until that generation was filled with the knowledge of the glory of God. God often use what we define as challenges to build character stability within his own. There’s a need for a change of perfective as we press towards the curvature of a new earth. Allow the seemingly complex trials and of your life to push you closer to the father. Let the crisis build your spiritman as you hunger for more of a prayer lifestyle. There is a place in the Spirit, where we no longer struggle with the will of the Father, and that is the place where all things lost will be restored in a new format. Challenges break our pride by opening the gateway for us to completely surrender to the Lordship of Christ. This is what the life of faith is all about. The scripture we are gleaning re-echoes the on relentless desire of the Lord’s prophetic objective to dwell amongst his people as the only compass that leads and direct them toward his ordained destiny. To accomplish this desire requires that his presence will live perpetually amongst them. One of the things that makes Israel unique among the nation is the promise God made with them to dwell in their midst forever. He promised that his Name would remain among his people. ersonal level or in a corporate perspective. Secondly, to see that the kingdom of God comes to bear in every facet of life and the Lord’s will becomes established on earth as it is already done in heaven. Therefore brethren, this is our moment to show the world that God’s dwell amongst his people and they can come and partake of his presence and find safety in time like this. Let your hands not be weak in building the ruin places call the house of the Lord. Before you click the like button next time. While most of us are on social media to interact and develop productive friendship relationship, we nevertheless need to be highly mindful that not everyone on these platforms are there for the right reason, and this includes those we may assume to be Spirit filled Christians. It is becoming clearer that what we say or project on social media are instantly becoming the very extension of our physical, personal world to the degree that someone can gain instant opportunity or breakthrough. While others on the other hand can Incur the wrath of friends or be displaced at the work place because of a wrong attitude expressed on these media networks. Hence, we see these two parallel sides on social networks that we must be cognizant of. My worry however is the increasing reality of the idea of those who employ the social media to project their false belief in regards to how they manipulate and interpret the word of God to frame their own narration of reality. Please friends, carefully read and understand the intent of what I am saying before I am misinterpreted. I am not proposing that people should not comment or like our post. It’s been proven that for the fact that someone clicked the like button on your page or post does not necessarily mean they are in complete agreement with you. My point is, clicking the like button has become a measuring yardstick of who we think like us or dislike us. This is such a shallow concept of relationship in terms of matured, biblical standard, and I suggest we should move away from this carnal notion. Before you post your words, comment or click the like button, it’s important to capture the state of your thought and attitude, particularly with regards to what you’ve just read. Many of the posts and comments we read almost instantly on Facebook are reactionary by nature. 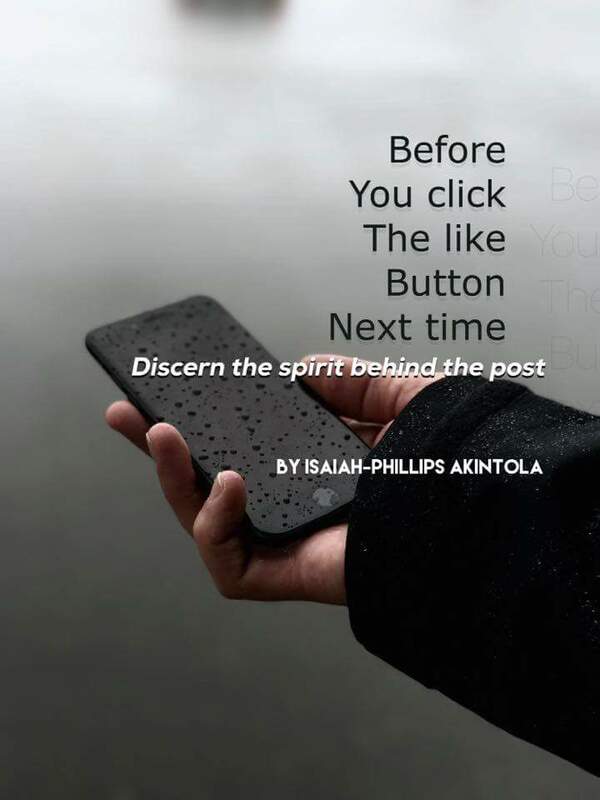 While you have those who are given a true, inspiring, motivational, encouraging and challenging message to the body of Christ on the cyber space. You also bear on the other side, those who will be either responding intelligently to what have been written, or those who will be negatively reacting through their unhealed and unbalanced emotions. My focus, however, on this note, is to highlight this set of group who seek to use the social media to reinforce a seemingly biblical believe to enforce a rebellious (attitude) stronghold they know exist within them. Because of their knowledge of the word of God, coupled with some biblical traditions they’ve mastered down the years of their Christianity, it’s easy for them to use scripture to say what they want to say without necessarily having the spiritual and emotional discipline to deal with matters objectively. It is really difficult to falter these individuals if one lacks a deep sense of discernment and the operation of the Spirit of wisdom within. You have innocent, spirituality unskilled Christians in the name of unity or relationship, following these individuals or group exclusively to be used for endorsing their false, unbiblical, disobedient narrative of what they term as the gospel of the kingdom. In most cases, they use their knowledge of scripture, giftedness and a sense of maturity to lure others who may be exposed to the scripture, but have very limited knowledge on the laws of sound, balanced biblical interpretation. Let’s not seek to endorse or reinforce people’s inherent strongholds by merely clicking the like button on social media, especially when such opinions are back up by using the word of God outside. Anyone can use the word of God to say or mean whatever they want it to say for them. Often times, scriptures are used for interpreting our own bias, narrow view of what we think, see or believe regarding a person or situation. I have often picked out how excellent scriptures are taken out of context to buttress the idea of a particular perspective we want to project. This is a clear reflection of witchcraft practice in its highest level. If we permit others to manipulate us to approve or justify their wrong belief system just because they’ve perfected the act of using scripture to validate their opinion, we shall be greatly judged for our blindness and lack of discernment. This is a word for all believers and followers of the lamb. The current ongoing America election is far from the race of two strong democratic ideologies. Ideologies are shaped and influenced by a preferred philosophy. The policies that shapes and determine nations are designed to project certain belief system either good or bad. Any wise one tracking the current global affairs, we immediately realize the strong direction of the two main candidates running for the position of presidency in the White House. The battle over the seat of the White House has never been this personal and challenging in the history of America. It’s clear that people are now hungry for a new direction in the policy of governance while the other seeks to maintain and push for the policy of globalization. Whoever wins the seat of the White House will certainly determine the next direction in the fulfillment of global prophetic affairs, in terms of the ultimate collapse of the empire of the kings of the earth. There’s no doubt that what is behind the force of election shapes the economic, political and spiritual climate of a region. While democracy is not the concept of God’s government. It is however, accepted as the best way of human government, and if we are in this world, our lives and that of our family will be influenced by the democratic government and leadership in place. The scripture abundantly made clear that we respect and honor human government, for it is the lord himself who placed them in the position of authority. Therefore, it will be naïve of any Christian to suggest that the political shift within nations, but in particular, the nation of America, carries no serious meaning or relevance to the ongoing emergence of the kingdom of God. It’s like saying that the political architecture of the Roman Empire has nothing to do will the prophetic unveiling and fulfillment of Christ redemptive purpose for his generation. The world of Palestine and it’s then socioeconomic and political landscape was planned and arrange as a portal for the prophetic redemptive program of the father. Everyone, including the Roman occupation of Israel had a key role to play in that which the father designed to carry out in those days. Nothing happened habitually. Every movement, thought, action and decision were divinely designed to lead to what was has been planned in the fulfillment of God’s program. Jesus said to John at River Jordan, let it be so for the fulfillment of what has been written to become manifest. Prophecy doesn’t fulfill themselves. They must be carried, nurtured and birth within the setting of their ordained place of fulfillment. The prophetic desire of the father is shaped by a company of watchers, positioned as salt and light within a geographical region. These men and women track the movement of the Spirit for their nation and generation. Hence, they know what to do within any given situation in their region of assignment. As gatekeepers, they track and follow the prophetic trajectories of the Spirit, even amongst the things we will count as ordinary and irrelevant. It is, therefore, critically important, we understand that even things like election and voting plays a huge role in the advanced fulfillment of divine intent. A shift in the prophetic trajectory of any generation requires the ecclesia to update again, it’s revelatory wisdom and insight into the mind and will of the father to accurately adjust the structure posture and direction of what we are building. This allows the church to perfectly align with agreement towards what the Spirit was saying and demanding for the next season. The ongoing shaken of the foundation of the nations will continue to the attention of the kings of the earth is drawn to the hand writing of the father on their walls. Only those who have been sealed on the forehead will be able to read and interpret the writings of the Lord. There’s now a specific writing of the Lord upon the walls of every nation, including the nation of America. Those who are designed to play key role in the acceleration of the fulfillment of God’s prophetic calendar are now being posited to their rightful place with authority to speak with authenticity and accuracy. As we continue to live in the days of the last kingdom of Iron and clay, we need to change our prophetic lens to see and understand the role each of are called to play in bring forth the judgment counsel of the Lord upon Babylon. The battle against the tradition, ideology and ways things has been for decades are now coming to an end. As new formats of leadership arises with a nationalistic agenda, we will continue to see the battle of ideology play out on every front. A globalist mentality is now being challenged even from within the Europe. The architectural purpose of globalization is being tested as iron and clay cannot hold together. It is clear that the globalization socioeconomic policy builds on the foundation of the western world concept of democracy is now falling apart as people begin to realize how they are losing their identity and economic security. Americans also tow the same line the British did a few months ago by leaving the European Union. Yes, this new direction of the policy will change the economic direction of the nations for a while until new relationship and bilateral agreements are reached. Our position as the church of the Lord is to continue to hold the standard of the Lord within the [blindness] confusion of the heart of men. We are called to be a light house; a city set on the hill that cannot be hidden. It’s time we update of the prophetic software for increased engagement with the nations and kings of the earth. Let’s make disciples of all nation.